strong property in the Chelsea-based Colwen Management group of hotels. The property officially opened on July 25. The new, 124-room, full-service hotel gives Colwen its fourth property in Chelsea, with more than 500 rooms added since their first property – the Residence Inn – came online a few years back. 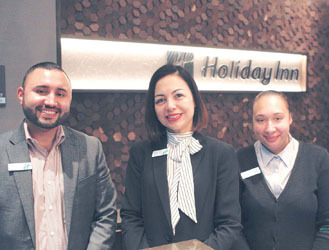 The new Holiday Inn will celebrate a blockbuster grand opening on Nov. 8. Colwen now has the Residence Inn, TownePlace Suites, Holiday Inn and Homewood Suites in Chelsea. That adds to their larger portfolio of properties across Greater Boston, including the new AC Hotel in the South End of Boston and the newer property that opened last week at Assembly Row. The new property continues the tradition of great design on the properties, with interesting lighting and lots of natural light. The foyer includes a great sitting area, with a fireplace as well. Since it is a full-service property, Fiorello said the free breakfast option isn’t available. Instead, they have a European-inspired breakfast buffet and a al carte items as well. They also have a full restaurant and bar on the property, which Fiorello said would likely play well to local residents of Chelsea and Revere. They will be serving popular items like steaks, lobster rolls, salmon and other dishes. While there are no suites like in the other properties, the rooms are large and most try to focus on a view of the marsh or the City. Each room has smart TVs and luxury bath products as well. The building is an LEED certified property. For functions, they do have a space that is available for small functions or meetings. It holds about 60-80 people and can be divided in half. It’s called the Mill Creek Ballroom. Maureen Foley was installed as the 91st president of the Rotary Club of Chelsea at the organization’s Installation of Officers Receptions June 21 at the Homewood Suites Event Center. Rotary Club President David Mindlin (right) and President-Elect Maureen Foley congratulate Paul Harris Fellow honoree Ledia Koco after she received the prestigious award. Foley was on her home turf. She is the director of community relations for Colwen Hotel Management which operates three hotels in Chelsea, with a fourth, brand new hotel on the Chelsea-Revere line set to open soon. Foley has become the face of the busy and beautiful hotels since their openings. She is visible at community events and has been a goodwill ambassador for Colwen with her numerous philanthropic and community-spirited endeavors. And now she’s ready to lead one of the city’s most prominent service organizations that has been here for close to a century. She succeeds outgoing president, Attorney David C. Mindlin. 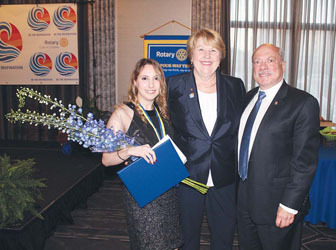 Foley, who is the eighth woman to serve as Rotary Club of Chelsea president, called it “a great honor” to be the new leader of the club. She noted that Rotary International approved a new vision statement last years. “It says, together we see a world where people unite and take action to create lasting change – across the globe, in our communities, and in ourselves,” Foley told the gathering. As proud as Maureen Foley was to take office as Rotary president, you could sense the equal feeling of joy and proudness in her daughter, Marika, son, Peter, and 5-year-old granddaughter, Aria, who sat together at a table closest to the podium. A long-awaited hotel study commissioned by the City has been completed and indicates that the market in Chelsea could support and ‘upper upscale’ property if one were proposed. City Manager Tom Ambrosino commissioned the study last year when a hotel was proposed on Second Street, and it wasn’t certain if the market in Chelsea could bear more hotel rooms coming online. The study was done by the Pinnacle Advisory Group, and they indicated that a seventh hotel property in Chelsea could be successful – perhaps one that is nicer than all of the others. By contrast, the Homewood Suites and Residence Inn in Chelsea are considered upscale. The Hilton Boston Logan and Hyatt Boston Harbor – both at the airport – are considered in the upper upscale class. He said he was also encouraged by the suggestion that the market could bear a more luxurious product than the very nice hotels already in Chelsea. The study also indicates the best areas for another hotel would be on the east side of the Chelsea Creek and at the Mystic Mall. “We believe the City’s seventh hotel should be developed in conjunction with support amenities in a location proximate to Boston Logan Airport and the new MBTA Silver Line,” read the report. The study was forwarded to the City Council on Monday for review. No new proposals have been forwarded, thought the Residence Inn on has proposed an expansion at its existing property. Last summer two friends were chatting about how expensive college tuition is these days and the impending mounds of debt their collective six kids were most likely going to be faced with. The conversation continued and one of the moms shared that she happened to be in the audience when Major Nippy Betz gave his TEDx talk a year prior and she was lucky to get to speak with him afterwards. She recalled having her mind blown open about the hidden world of scholarships and how if you cast a wide net, and are disciplined (just like fishing), you can reel in a boatload of free money. It was at that moment where they looked at each other and had an idea. Like many moms, these friends are employed, over-extended and crazed, however they decided they needed to bring Nippy to Boston to share his education and his secrets. As they began to dig deeper, it became quickly evident that there was a lot they didn’t know, and likely other parents didn’t know as well. They decided to roll up their sleeves and plan the first ever Massachusetts Strategic Scholarship Bootcamp. The elevator shaft and steel structure can be seen this summer going up on Chelsea’s next new hotel, a 124-room full service hotel at the Chelsea Line. The Chelsea Broadway Hotel – not yet named officially – is making quick work of the vacant site next to the Walgreen’s on Broadway adjacent to the Chelsea/Revere line. The hotel – another new hotel brought by Colwen and the XSS Group – is likely to be even better than the previous hotels, the last of which (Homewood Suites) just opened across from Chelsea High School. There are rumors that the Broadway hotel will include a restaurant that has water-side seating during the summer months. That, however, could not be confirmed. The site overlooks the Mill Creek and marsh – an area that has been vastly improved and cleaned up in the last 10 years. 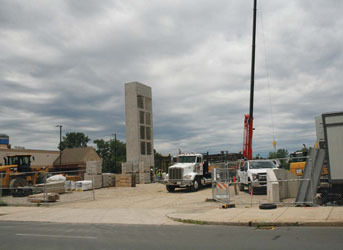 The hotel property will also serve as a major connecting piece on the walkway that leads to the Chelsea Commons Park. Already, the elevator shaft and steel structure are towering above Broadway as the building takes shape. Maureen Foley of Colwen Hotels said that the Broadway Hotel is a 124-room hotel that will open in late 2018. She said anyone looking for job opportunities at the hotel or any of their other Chelsea hotels can log on to www.colwenhotels.com. Chelsea Police Captain David Batchelor was honored for his outstanding work with Chelsea HUB, which is a team of designated staff from community and government agencies that meet weekly to address specific situations regarding individuals facing elevated levels of risk. Chelsea HUB develops immediate, coordinated and integrated responses to these situations through the mobilization of resources. 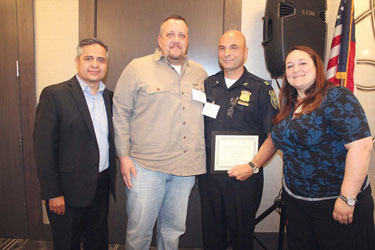 Pictured at the award presentation during a HUB training program Monday at Homewood Suites Hotel are (from left): Dan Cortez, community engagement specialist, Chelsea Police Department, Jason Owens, an assistant director at Roca, Capt. 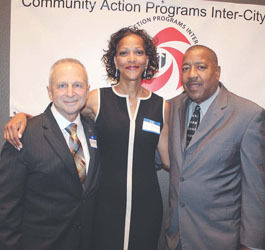 David Batchelor, award recipient, and Melissa Walsh, director of Chelsea Thrives, The Neighborhood Developers. A clean-up that was supposed to cost about $1 million has ballooned to a $3 million project for the new Homewood Suites hotel going up across from Chelsea High School, prompting City Manager Tom Ambrosino to ask the Council to revise the terms of the existing tax break for the hotel. Ambrosino proposed an enhanced Tax Incremental Financing (TIF) agreement for the hotel, and two smaller TIFs for a new hotel on Broadway and the move of Rosev Dairy to Griffin Way. The hotel was once a heavy metals manufacturer, Lawrenceville Metals, and officials at the groundbreaking of the hotel said the heavy metal contamination was some of the worst they had seen in the Northeast region. However, it was believed that the costs could be contained at $1 million. That has not panned out, leading to delays that were, until now, unexplained. The new TIF agreement looks to move from five years to seven years with enhanced tax breaks on the new value. Year one and two would go from 50 percent tax reduction to 60 percent. Year three and four would go from 40 percent to 50 percent. Year five would be at 35 percent. The last two years would remain unchanged at 25 percent. The overall investment into the property is pegged at $33.79 million. He said there would still be significant new tax revenues brought in by the property even with the enhanced proposed TIF. He said new tax revenues would still exceed $1.5 million per year from the property. Another hotel on Broadway, near the Revere line, was proposed to for a TIF as well. The Broadway Hotel is expected to invest $29.56 million into the vacant property at 1012-1018 Broadway. The TIF terms for that agreement are proposed to be five years, with 50 percent at year one, 40 percent at year two, 25 percent at year three through five. Finally, it was announced that Rosev Dairy on Second Street has decided to relocate within Chelsea to a building they have purchased and will renovate on Griffin Way. “This is really a token TIF to let the company know we are encouraging their investment,” he said. That TIF agreement proposes five years with a 5 percent break. TIF agreements have been routinely used in Chelsea to attract and retain businesses. It is important to note that businesses getting a TIF only get the percentage break on the new value they create. The existing value on the property is taxed at the regular rate. The matters were sent to be scheduled for a public hearing. City Councillors unanimously approved a tax incremental financing (TIF) agreement with XSS Hotels that would help them enter into an ownership partnership with the Wyndham Hotel – a partnership that would be for the purpose of renovating the 15-year-old hotel. The renovations are said to be just short of $10 million. The Council voted 9-0, with two absent, to approve the recommendation by City Manager Tom Ambrosino for a five-year TIF. XSS Hotels operates several hotels in Chelsea already, including the Residence Inn and TownPlace Suites. They would enter into a partnership with WEDGE Group of Texas, which currently owns the hotel. Councillor Giovanni Recupero said he supports the measure because it retains jobs. The plan would be for five years and would offer up to 60 percent relief in the first year from property taxes and personal property taxes. By the fifth year, it would trail down to 30 percent relief. Ambrosino said the total new tax dollars to the City during the TIF would still be substantial, even with the discount. That figure was $243,307 in new taxes during the TIF as a result of the renovations. The renovations would require a complete closure of the hotel between November and March. In that time, Thomas wrote that current Wyndham employees would be offered employment at other area hotels in its network. Transportation would be provided to those employees if the new job is outside of Chelsea.